Polaris Outlaw 525IRS Exclusive Review. 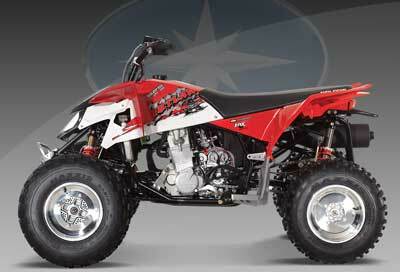 The Polaris Outlaw 525IRS is an evolution of the sport ATV that pioneered independent rear suspension - the Predator. Now with a hot rod KTM engine and first class suspension, Polaris keeps making improvements to the model. Let's check 'em out. But first - here's a video test of a 525 IRS model. Watch this if you like, and then we'll tell you what's different about the new ones. Lighter weight because that's always a good thing. 6 pounds to be exact. Revised bodywork so moving around on the quad is easier. Modified steering rod pivots to reduce "bump steer" and scrub radius for more stability, less kick back at the bars, and reduced steering effort. Standard 8mm bolt heads on all the bodywork and the elimination of 47 other fasteners for quicker and easier maintenance chores. Aluminum heel pockets for lighter weight and easier movement. Aluminum front bumper for lighter weight and a cleaner look. The new Polaris Outlaw 525IRS sports 10 inch rear wheels that improve ground clearance and stability on the trail. Most of the other changes fall into the category of tweaks. The revised steering will make the most difference where performance is concerned. Excellent power from the bottom to the top. Quick off the line for good starts. Suspension works well enough stock with some adjustability. Fox Podium shocks will do the job for a beginning racer or trail rider. Brakes work well enough to race without mods. Braided stainless steel lines improve durability and feel. Maxxis Razr tires are a good choice for all-around trail riding. With 11" of wheel travel and the independent rear suspension, the rougher the trails, the better the 525 IRS works. Magura hydraulic clutch and adjustable brake lever have a nice feel and reduce rider fatigue. More comfortable for all day rides than straight axle ATVs. 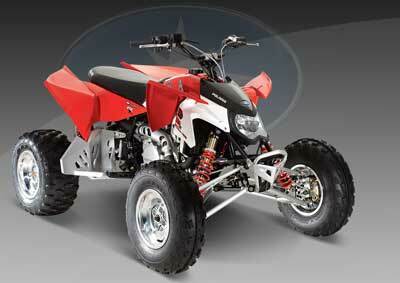 Excellent choice for a high performance ATV for trail or open rough terrain riding. A broad power band, good suspension and brakes, decent wheels and tires, and good ergonomics all work together to make rough trails seem smooth. May be a tad small for taller riders with the stock bars. A few miscellaneous reliability issues but nothing consistent enough to call a real problem. Restrictive and cramped air box. Suspension may need upgrading for racing. 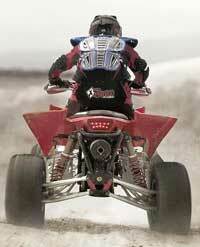 Doesn't work as well for racing or on smoother surfaces as straight axle ATVs. 20 pounds heavier than the straight axle 525 S.
Trouble tracking straight in multiple whoop sections. A recall was issued for 2006 - 2008 Polaris Outlaw 525IRS models. A retention bolt can come loose causing the rear wheels to lock up, which poses a risk of serious injury to the rider. Check with your dealer if you haven't already. Probably not the best choice if your main goal is racing. When you start to hustle it, the extra weight can hurt and it tends to push in and out of tight corners compared to a straight axle. Not many negative comments from owners we interviewed. A few mentioned the plastic and the bolts which have been changed on the 2009 model. The Polaris 525 IRS Outlaw has not changed significantly since 2009. What Polaris Outlaw 525IRS Owner's Said. "If you're looking for the perfect ATV, this is it. My son and I have been riding for many years and I can tell you this is the best machine bar none. We have the Polaris Outlaw 525IRS. It has great suspension and great power and speed. I very rarely write reviews, however I think if you're looking for your next ATV, trust me, this is it. I love it." "The quad itself is the best trail riding quad I've ever ridden, that includes 4x4's! It also has high ground clearance so I don't have to dodge obstacles in the trail, I just cruise over them." "I bought this bike wanting something that could take anything I could throw at it. The Polaris Outlaw 525IRS is probably the best woods and "anything you want it to do" bike." The 525 IRS is the only Outlaw model for 2011 and beyond. The Polaris Outlaw 525 IRS would be on just about anyone's list that wanted a performance ATV for trail riding and maybe even cross-country racing. We think some of the problems mentioned for racing may be caused by the rear suspension not being dialed in. So while the 525 IRS wouldn't be our first choice for racing (specifically motocross) some time spent at the rear can improve things a lot. The same trails that would beat you up and rag you out on a straight axle ATV barely seem challenging on the Polaris Outlaw 525 IRS. So if you like to ride rough terrain all day and can't afford a masseuse afterward - we suggest you take a look at this Outlaw. Polaris Outlaw 525S - The S stands for "sand" - but this ATV will work in the woods or on the track too. Polaris Outlaw 450 - The Polaris Outlaw 450 MXR is the thoroughbred racer of the Outlaw line up for 2009. The KTM engined racing ATV steps up it's game with several racer requested changes.